Albino Bruno Mariotto was a skilled cabinet-maker and restorer as well as a keen painter. 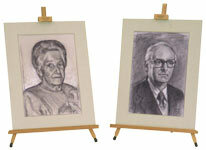 Together with his wife, Rita, he decided to set up a craft shop producing easels for painters in Ispra, a small town on Lake Maggiore. Within a few years the production of artists’ easels became so successful that he needed to move to the nearby town of Gallarate, where he set up a small workshop of 250 sq.m. Albino Bruno’s son, Luciano Mariotto and his son-in-law Giovanni Tottoli joined him in the business and with them the company started to export abroad. A new production unit covering an area of over 6000 sq.m. was set up in Cardano al Campo, where the company is still based. The company took on the name M.A.B.E.F., using the initials of its founder: Mariotto Albino Bruno & Sons (Figli in Italian) and the brand name began to be known internationally. Luciano designed and produced an easel in kit form that was easy to transport, assemble and use. This “invention” further enhanced the success of M.A.B.E.F. easels. Albino Bruno’s grandchildren, Laura Mariotto and Sandro and Paolo Tottoli joined the family business. Laura and Sandro look after the commercial and marketing aspects, consolidating the “M.A.B.E.F. brand”, while Paolo deals with the technical part and production. M.A.B.E.F. pays great attention to environmental issues. 100% of the wood waste from production is recycled and transformed into pellets, an ecological fuel used in heating the factory and offices. M.A.B.E.F. obtained the FSC® certification (www.fsc.org Codice licenza C010161, Forest Stewardship Council®) thanks to the environmentally friendly choice of the raw material used in the manufacture of M.A.B.E.F. easels. The wood used is top quality solid beech, coming from certified forest areas where immediate replanting is guaranteed. M.A.B.E.F.’s success is worldwide, thanks above all to the constant commitment to sourcing all materials and accessories produced exclusively in Italy or in Europe, so as to guarantee the quality and reliability of a product that is 100% “Made in Italy”. M.A.B.E.F. owners have dedicated their skills to managing the company over 70 years. In responding to clients’ needs and requests with traditional seriousness and courtesy, the company has aimed to achieve technical innovation and constantly improved production. The result is a solid and reliable product that is guaranteed to last over time; in fact all M.A.B.E.F. products carry a “lifetime” guarantee. M.A.B.E.F. exports its products to nearly 60 countries all over the world. A M.A.B.E.F. easel is a product that will last you a lifetime, a tribute to the passion and craftsmanship of its creators.